Ann Crooker St. Clair Chapter of the National Society Daughters of the American Revolution honored eight Good Citizen winners with a brunch Saturday. Seven of the students and their families were in attendance. The chapter winners received pins and certificates to commemorate their achievement. 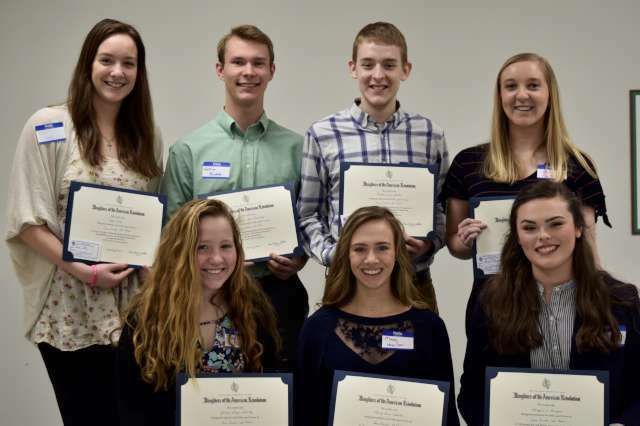 The eight seniors chosen to represent their schools as Good Citizens were picked by school faculty on these qualities: dependability, service, leadership and patriotism. Unable to attend was Allie Stell from Beecher City High School. The winners this year are, front row, left to right: Jocelyn Schultz of Stewardson-Strasburg High School; Macey Heselton of Cowden-Herrick High School and Abigail Burgess of Effingham High School; and back row, left to right: Kate Volk of Teutopolis High School, Nathan Budde of Altamont High School, Seth Bohnhoff of Dieterich High School, and Abigail Repking of St. Anthony High School.